The Kenya Revenue Authority (KRA) is the government body that manages the nation's revenue income, which is most often in the form of taxes. The agency came into existence in 1995 and has drastically improved the country's taxation revenue through organized administration and collection practices. The majority of the nation's budgetary revenue comes from internal taxes, which go to pay for services such as health care and education. Needless to day, the revenue for a country is more complex than simple taxes, so the Kenya Revenue Authority works in 5 departments. They are customs services, domestic taxes, road transport, support services and an investigation department. Each department is run and managed by an official Commissioner, and covers a different aspect of national revenue. This is the largest department of the Kenya Revenue Authority, with the most staffing and levels of revenue collection. Collecting and managing income from import duties and value added taxes (VAT) on imports, is what makes up most of their responsibility. Other areas that fall under the department of Customs Services are sugar levies, petroleum development levies, road transit tolls and air passenger service charges. 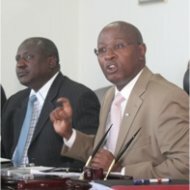 This department also oversees the regulation of illegal or prohibited goods across the Kenyan border. There are two sections to this department, income taxes and value added taxes (VAT). Like in North America, the most common way of collecting income tax is to have it withheld by the employer for each pay cycle, and then remitted to the KRA. The VAT was introduced in 1990, replacing the previous system of sales taxes. The original sales tax was only applied to goods at the manufacturing level, so the VAT was implemented instead to increase government revenues through the taxation of goods at the consumer level. The Transport department is involved with all the various licensing and registration requirements for drivers and vehicles. This includes all fees, levies, taxes and duties necessary when importing vehicles into the country. This department is an internal one, and manages all the day-to-day work for the KRA. Duties include things such as human resources, legal services, corporate planning and public relations. This final KRA department handles all tax and customs investigations. Problems such as tax evasion and fraud, illegal import documentation and improperly registered vehicles are the responsibility of the investigation deparment. To better manage the entire country, the Kenya Revenue Authority operates in 5 regions: Rift Valley, Western, Southern, Northern and Central regions. 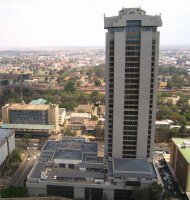 The central headquarters is in Nairobi, in the Times Tower (see picture). A 38-story office building, its the tallest building in the capital city and tenanted only by the KRA. Their website is up-to-date with the latest tax information, and provides an easy way for anyone to view or download any related government forms. In 2004, the KRA instituted the Revenue Administration Reform and Modernization Program (RARMP) to further develop their use of technology to create a modern tax collection for Kenya. The second phase of the RARMP is due to be completed by 2009, and is expected to further improve efficiency and delivery for customers. Even with improved systems and streamlined management, the Kenya Revenue Authority is not without its problems. In 2009, investigations began after the purchase of patrol boats, for use by the customs department. Pricing irregularities prompted concerns that some KRA officials were pocketing money through the deal.